On Aesthetics | Condensed Fonts | A Continuous Lean. On Aesthetics is a look at the details of design and the things around us. The first installment is by Mr. Benjamin Ferencz who divides his professional time between running The Design Cooperative and building some pretty awesome bicycles for his company Freeman Transport. There was a time when I lived in New York that I wore Helmut Lang shirts almost exclusively while he was still at the helm. Having relocated to Montana I was on the hunt for a more casual shirt with a similar narrow cut but with a soft collar. While shopping at Odin on a business trip I found my new perfect shirt made by Mr. Robert Geller. The perfect complement to my dressier Lang shirts. I bought three. I tend to do this in my old age of 32. Before I put the shirts in the closet I did my usual inspection of tags and labels and noticed the beautiful type chosen by Geller. Familiar. I grabbed a Lang shirt, very similar. No icon used, just the unique letter shapes to create a distinguished mark while evoking a slender spirit. Both chose a condensed face to represent them. I starting thinking. This narrow typeface matched the cut of the designers clothing. Then it started to occur to me that some of my other favorite brands were also feelin the condensed vibe. Tim Hamilton even went so far as to say Futura condensed was a momentary style obsession. 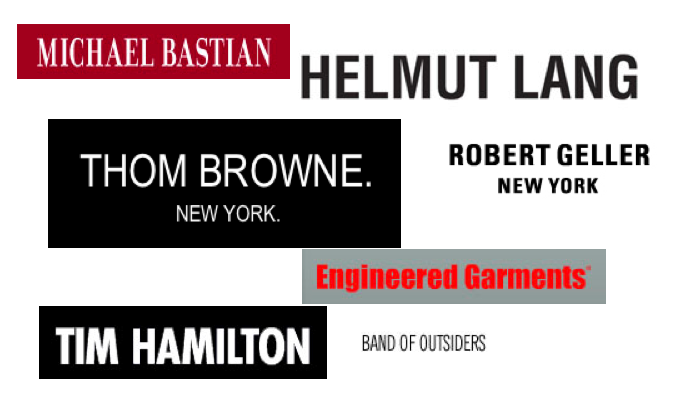 Band of Outsiders, condensed. Engineered Garments, condensed, Thom Browne, condensed. And so I sign off by saying keep it on the straight and narrow please. Let’s not forget the best condensed one (in my book at least) Jack Spade. Trade gothic condensed bold 20. I’ve always loved a condensed font, but I do because as a graphic designer it makes it easier to fit more text into a narrower horizontal space… and considering that most of the brands you featured have long-ish names, it’s not surprising.